As this website is growing both in size and complexity, it seems likely that a first time visitor might have some problems finding out what this website has to offer, and how to get to it quickly. With several new features added during the last few month, and a few more in the making, even regular visitors might be a little overwhelmed or confused, so I decided to add this special Help page, which will take you on a virtual tour through the site, and explains what you see and what you can do with it. Please take a few minutes to read the instructions on this page, and when finished, you'll know exactly where to find what, and how to get there immediately. and it is available on every page of this website, both at the top of each page, and, again, at the bottom of each page. On the far right of the Menu Bar, you'll see "Help", which usually takes you back to this page. Notice that the Main Menu also shows you where you are: right now, "Help" is not a link, because you are already looking at the Help page. In the upper-right corner of every page there is a navigation pane, made up from a square and some triangular golden plates. The square in the middle is a home link, and it is always present. The triangles, or arrows, pointing left and right are previous and next page links, and they depend on what you're looking at. Starting from the Home page, the Next and Previous arrows allow you to browse through all the sections, in the same sequence as the Main Menu. However, within the Title pages, these arrows let you browse through the titles, and, within the Edition pages, through the editions. The Down arrow, if available, allows you to enter a certain section, so when you're looking at the Title overview, the Down arrow takes you to the first title, Tarnsman of Gor; while in the Edition overview, it takes you to the Ballantine Edition. The Up arrow, if available, takes you back to the overview pages. When looking at a particular Book Page, the Left and Right arrows allow you to browse through the titles within a particular edition, the Up arrow takes you to the Title Page, and the Down arrow takes you to the Edition Page. On either side of the Down arrow, there might also be Previous Printing and Next Printing arrows, which allow you to browse through the printings of a particular title. This is probably the first page you saw, but if not, you might want to check it out. It starts with an overview of all the sections, using the same links as in the Main Menu. After Breaking News, which might not always be there, there is an overview of the Home Page Contents, and it holds chapters like "Latest News", "What's New? ", "What is this website all about? ", "Who is John Norman? ", "What are The Chronicles of Counter-Earth? ", "The Ultimate Edition", "Design and such", "Development Edition", "You can help! ", "Jon's Bookshop" and "Site Statistics". Take a moment to browse through the Home page. Did you notice those little gold triangles at the right side of the page? Clicking on one of those takes you back to the top of the page, and yeah, they are everywhere! On the left side of the Book Page you'll see the front cover, the spine, and the back cover of the book. Sometimes, we don't have the spine or back cover, and you'll only see the front cover. If we don't have the front cover either, you'll see a big question mark. If you click on any of the images, you'll jump to the end of the Book Page, where we show you the large size images. Clicking on any of those, takes you back to the top. So the Hunters of Gor you're looking at, in this example, is a paperback. Behind the format there might be links to other formats of the same book, if such other formats exist. In this case, an eBook and an Audio book. These links are language dependant, so you won't see a link to an English eBook in a German paperback, but you might see a link to a German eBook, if it exists. Many books, including this one, also have a Current link added to the other formats. This happens when a book is no longer available (like, for example, the Ballantine and DAW editions), and the link takes you to the same title within the currently available edition (for the Ballantine/DAW example, that would be the Second Printing of the E-Reads Paperback Edition). These flags are links to other editions and translations, and they only appear if an other edition of translation is available. The British flag, for example, links to Sidgwick & Jackson Edition of Hunters of Gor, while the American flag links to the Masquerade Edition. The German flag links to the German Heyne Edition. Sometimes there are several other editions or translations in a certain language; in case of the German translation of Hunters of Gor, for example, there are two different translations, from Heyne and Basilisk, and when that happens, the oldest edition is linked, which would be the Heyne translation. However, within the Heyne Edition, the German flag links to the Basilisk edition, while the American flag links back to the DAW edition, so you can view all the available other editions and translation by simply clicking on this line of flags. Pretty neat, eh? These are links to our high resolution images, and if you click on any of them, your browser will display the image, which can then be easily saved. Do note, however, that the only way to return to the book page is by clicking on your browser's "Back" button. Below all of this there are four to six other chapters: Notes contains remarks and details about the particular book, Back Cover Text (or Synopsis in case of eBooks) speaks for itself, High Resolution Images contains an overview and technical data of all the hi-res images, and Full Size Covers ends the book page. Some book contain an additional Interior Artwork chapter with thumbnails of all the interior illustration. Click on any of these thumbnails to see a hi-res version. Currently, I am adding a sixth chapter to the bookpages, entitled "Content Version". More information about that will follow shortly. The Title Pages originally started as software generated overviews of all the front covers of a certain title. 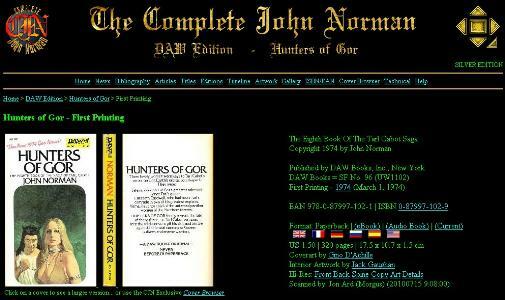 If you click on Titles in the Main Menu, you'll see an index page with all the titles of the Gor books, John Normans other books, and work written by John F. Lange. There are also seperate entries for Boxed Sets and Gor Omnibus. We currently show 49 titles. Each of these links leads you to a Title Page, with, at least, a Cover Gallery sorted by publishing year, and a second Cover Galley sorted by edition. Most Title Pages, however, have additional chapters, such as Publication History; a Cover Overview, showing the most important front covers of English paperbacks, eBooks, and translations; a chapter about Reviews and Previews, and a Chapter Overview. Future additions to the Title Pages include a Synopsis, a Word Cloud, and a Content Version Analysis. Like the Title Pages, The Edition Pages, too, started as software generated overviews of all the front covers of a certain edition. and again, the section starts with an index pages showing all the editions. I have added several special pages to this index, about Illegal Fan Fiction, Informational Works, and two pages about other authors by the name of John Norman and John Lange. We currently show 56 editions. Again, some of these Edition Pages show nothing more than a Cover Gallery sorted by title. However, most Edition Pages also include information about different printing, and background information about the publisher. The Artwork Pages also started as software generated overviews of all the front covers of a certain cover artist. We currently show 62 artists. For some artists, I have added background information, and an Artwork Gallery showing cover and original artwork side by side. Again, many artists pages only show a Cover Gallery sorted by edition. The index page of this section, the page you see when you click on Artwork in the Main Menu, also contains overviews of Logos and Banners, Interior Artwork, Special Artwork and Vision Artwork. These chapters, however, are temporary, and when all this artwork is used with the Title and Edition pages, these chapters will disappear. Be aware, that currently, this is a pretty heavy page, and it might take a while to load completely. The Timeline is a single page overview of all the different titles, editions and printings, sorted by year of publication. In other words, on this one page you'll see the thumbnails of all the 1106 books we have in our database. Each year is a chapter, and there is a table of contents at the top of the page, allowing you to jump immediately to a certain year and see which books were published in that year. All the cover thumbnails are specially generated to make them as small as possible, but this is still a very heavy page, and it might take a while to load. While the Timeline contains thumbnails of all the books, some of these printings look very much the same, and you can't really see the different designs that were used within the different editions. This is what the Gallery provides. Again, it is a single page overview, but all the similar covers have been omited, and the page is sorted by design series. Again, this page might take a while to load. This fast loading, text-only page gives you an overview of all the ISBNs and EANs. Each entry in the list contains an ISBN/EAN that links to the Book Page, a publication year that links to the Timeline, and a Title and Edition text linking to the specific Title and Edition pages. Please note that the ISBN cross reference is software generated, so always up-to-date, but due to software contraints, the EAN cross reference lags behind a bit. When in doubt, search the page using the ISBN for best results. In June, 2012, with the announcement of Conspirators of Gor, The Complete John Norman started its News section. Currently, we have a Breaking News chapter on our Home page, together with a Latest New overview of the last four or five News items. In the News section you'll find an overview of all our previously published News items. This section contains a working index to all bibliographical articles. Some of these articles have already been published between 2001 and 2002 in the monthly e-magazine The Gorean Voice. Many articles were edited and enhanced in 2008 and 2009, scheduled to be published at the Chronicles of Gor, in 2010. I never got around to it, and in September, 2012, due to internal problems, the publication was cancelled. The current articles are enhanced versions, with improved layout, table of contents, and better cover images, each linking to a Book Page. There is still a lot to be done, here, and much of the publication history is, as yet, still to be told. However, I first want to make sure that the bibliographical data of all the books is complete and correct, find all the missing front and back covers, and collect more background information about the publishers. This section contains a working index to all other articles. Some of these articles have already been published on the Chronicles of Gor website. However, from a technical viewpoint, the layout of these articles of very poor. As the CJN Development System provides a much easier maintenance interface, I have copied all the CoG articles to CJN, in order to update their layout. This section also contains some articles which could be published on CoG due to copyright or organizational issues. The Article section currently contains Interviews, Letters, Stories, Reviews, and Introductions by John Norman and Others. In the near future, I intend to merge the Article pages and the Bibliography into a single section entitled Backgrounds. The Cover Browser, a CJN Exclusive feature, and a first on the Internet, as far as we know, is a feature introduced in April, 2013, which allows you to sit back, relax, and enjoy an automated slide show of high resolution images of books and cover artwork. Each slide is displayed for 10 seconds (with a tiny countdown at the top of the screen), then the screen is automatically refreshed to show the next slide in the series. The show will keep repeating itself until you click on one of the appropriate links at the top of the screen. Select one of the available slide shows to start the Cover Browser. While it is running, you can click on the Stop link and manually browse through the slides by clicking on the front cover (either the left image or the Next link) to see the next slide in the show, or click on the back cover (either the right image or the Previous link) to see the previous slide. Use the Book link (if available) to see the bibliographical data for the book currently being displayed. Use the Cover Browser link to return to this screen, or use the Home link to return to the Home page. To start the automated slide show again, click on Play.